The conditions on 10 South are bleak. Its half-dozen cells are never dark and are perpetually monitored by cameras. The prisoners inside never go outdoors. Most days, they get an hour to themselves in a tiny “recreation” room with a treadmill, a stationary bike, a television and a window offering fresh air and a view of Lower Manhattan. Many are not allowed to speak with one another, but then again they rarely come face to face. 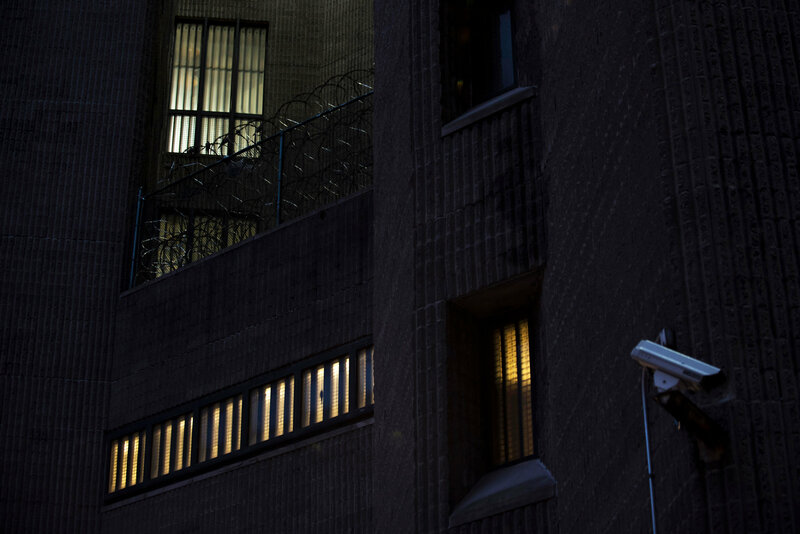 As the most secure wing of the Metropolitan Correctional Center, the federal jail in Manhattan, 10 South is so austere that a high-ranking mobster who spent several years there once described it as “a torture chamber.” The unit has housed some of the country’s most notorious defendants, from operatives for Al Qaeda to at least one notorious foreign arms dealer — all of whom were subjected to its harshness before they were convicted of a crime. The most recent — and perhaps most renowned — prisoner of 10 South is Joaquín Guzmán Loera, the Mexican drug lord known as El Chapo. In January, Mr. Guzmán was abruptly flown on a Mexican police jet to an airport on Long Island, then driven to the jail in an armed caravan. Ever since, he has been protesting his conditions of confinement and has taken up an unlikely role as an advocate for prison reform. 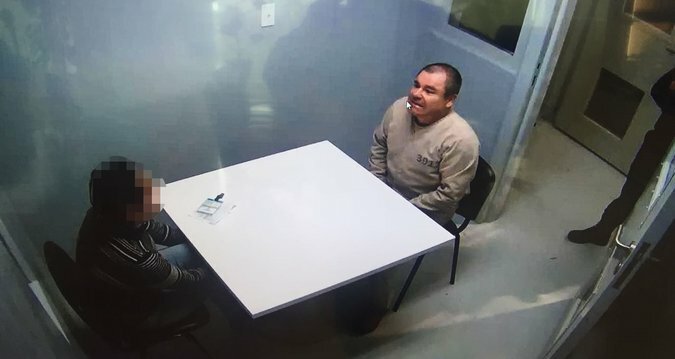 El Chapo at an undisclosed location as he was being extradited to the United States in January. Security is tight around the serial prison escapee. In a series of court filings, Mr. Guzmán’s lawyers have complained on his behalf that from the moment he arrived at 10 South, he has been locked in his cell for 23 hours a day, except for lawyer and court visits, and has been denied all contact with his family and the media. The lawyers claim that he is the most closely guarded inmate in the United States and that the terms of his imprisonment have hindered his ability to prepare for trial. Not only have they asked Judge Brian M. Cogan of Federal District Court in Brooklyn to loosen the restrictions he faces; they have also asked that a researcher from Amnesty International be allowed inside 10 South to investigate conditions. It is a strange turn of events that Mr. Guzmán, a serial prison escapee who stands accused of killing thousands during Mexico’s bloody drug wars, has claimed the moral high ground as a critic of the penal system. After all, he twice broke out of high-security correctional facilities in Mexico — first in a laundry cart and then by way of a mile-long tunnel dug by confederates into the shower of his cell. Given his history, federal prosecutors have defended the restrictions as a necessary measure, arguing that Mr. Guzmán retains “unparalleled connections” to his associates in the Sinaloa drug cartel — and has a “proven history” of murdering his enemies even while under lock and key. Though his environment is forbidding, some of the grievances he has lodged with jail officials — there have been at least 11 of them as of last month — have been decidedly small-bore. In one motion, Mr. Guzmán’s lawyers claimed that the tap water had disturbed his throat, prompting him to ask for bottled water. They also said their client briefly feared that he was hearing voices, though the government contends that he was merely picking up the sounds of a radio being played nearby. That said, the restrictions in 10 South are so severe that loneliness seems to motivate some inmates to break the unit’s rules. One of those inmates, Oussama Kassir, once greeted a fellow Muslim prisoner in Arabic while being escorted down the hall “in the clutch of two prison guards,” according to an affidavit filed by his lawyer. For that infraction, Mr. Kassir lost his telephone privileges for four months. The famously austere Metropolitan Correctional Center has housed some of the country’s most notorious defendants, from operatives for Al Qaeda to a notorious foreign arms dealer. Mr. Kassir was on 10 South for a year and a half, starting in 2007, while awaiting trial on charges that he had tried to establish a jihadi training camp in Oregon. During that time, he also went on a hunger strike to protest his conditions, losing over 25 pounds. Jail officials eventually “began force-feeding Mr. Kassir, which caused him great pain,” his lawyer, Edgardo Ramos, wrote in the affidavit. Few inmates have spent as much time on 10 South as Vincent Basciano, who prosecutors say is a former acting boss of the Bonanno crime family. According to his lawyer, Mathew J. Mari, Mr. Basciano once described 10 South as “a torture chamber that is a tool the government uses to try to make a defendant cooperate.” Currently serving life in prison on racketeering charges, Mr. Basciano was eventually moved from the solitary wing to the nation’s most secure federal prison, the so-called Supermax in Florence, Colo. He described the Supermax as “a five-star hotel compared to 10 South,” according to Mr. Mari. The Bureau of Prisons refused to identify the inmates who are now housed at 10 South. But interviews with lawyers and a review of court documents indicate that Mr. Guzmán’s neighbors include Muhanad Mahmoud al-Farekh, a Texan who is accused of being a Qaeda commander and whom the government once considered killing with a drone strike in Pakistan; and Maalik Jones, a Maryland man accused of fighting alongside the Shabab militant group in Somalia. 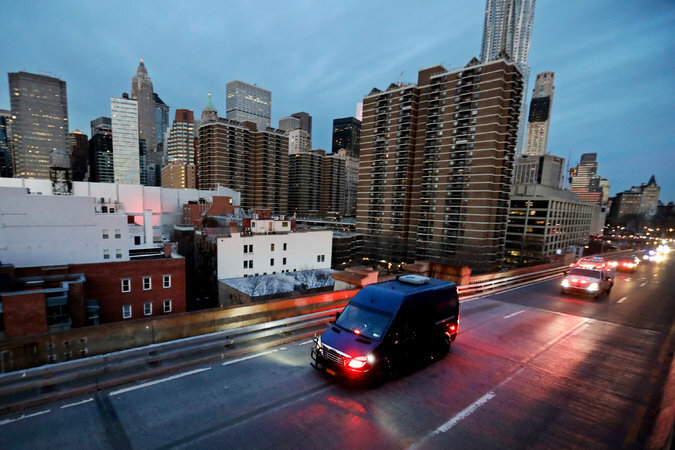 A police motorcade taking El Chapo from Manhattan to Brooklyn for a court appearance in February. According to a psychologist who examined him, Mr. Harun slept on the floor of his cell to avoid his prison bedding, which the defendant claimed hindered his body “from recharging electrons.” Lawyers visiting their clients on 10 South have said they often heard a din emanating from one of the cells, which they believe to have been Mr. Harun’s. The cells on 10 South are generally 17 by 8 feet. But prosecutors say that Mr. Guzmán has the largest cell on the wing and that prison officials have adequately addressed some of his complaints. For instance, he now receives six small bottles of water every two weeks, court papers say. The prosecutors also note that he has a radio and was permitted to buy a clock from the prison commissary. Though the clock was taken from him a few days after he bought it — “with no explanation and no refund,” according to his lawyers — he recently got it back. Even with these various restrictions, however, Mr. Guzmán has almost daily visits from a small army of lawyers, paralegals, investigators and interpreters — an unusual privilege for an inmate on 10 South. According to court papers, he spends an average of 21 hours a week with his defense team, suggesting that his isolation is considerably less severe than other prisoners’.